Q1: What made you decide to open a wholesale operation in Zamboanga? We felt there was an untapped potential and there was a big opportunity for the BIG BOX model in Zamboanga. Our primary target market were the sari-sari store owners wherein we feel they can be better served than simply offering them credit terms and low prices. We moved beyond matching the prices of existing players in the market, since item prices were the key deciding factor. We provided our customers the comfort and convenience of shopping with us by having wider aisles, better assortment, ensuring stock availability and friendlier services. 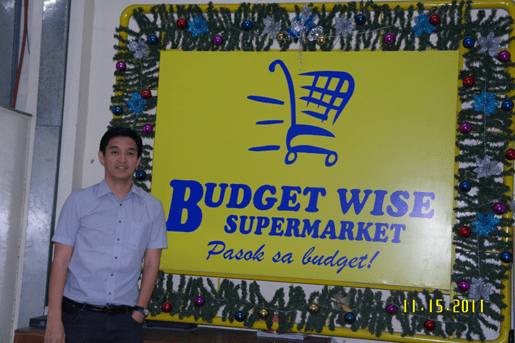 We were the first and only supermarket to implement no-tipping and free parking policy, since our target market are budget conscious business owners and customers, and we want to add value whenever they shop at Budgetwise. Q2: How do you intend to win versus a national player who may enter your territory? One main advantage of a national player is their deep pocket yet they have higher overhead than local players like us. We intend to outsell them by knowing our business and our customers better. Once everyone in our company understands how our business model works and what keeps us growing then it will be easier to lead everyone to move toward sustainable directions. Customer convenience, price and shopping experience will always be top priorities. By knowing our customers, we have to understand them better and build relationships with them. Our customer loyalty program will help us know them better and and guide us as to which customers to prioritize and establish deeper relationships with. We have to keep the relationship rewarding to keep them loyal. We need to differentiate our services by offering a positive shopping experience and personal touch in dealing with our customers. Q3: What is your vision for Budget Wise? Our vision is to be the number one retailer and wholesaler in Zamboanga that provides competitive prices and efficient services to satisfy budget conscious consumers.